(Hypebot) – The Doobie Brothers do not cite the etymology of the term "doobie" in their trademark lawsuit against the Doobie Decimal System rock band, though the slang term predated the band by a few years. Doobie Brothers Corp. and Doobro Entertainment on Friday sued Roger McNamee and Jason Crosby, who perform under the name Doobie Decimal System, a classic-rock cover band. 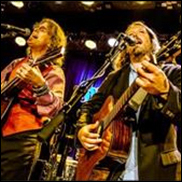 McNamee, also with Moonalice, and Crosby, a guitarist and fiddle player who has played with Eric Clapton, Carlos Santana, Dave Mathews and Bruce Springsteen, began using the Doobie Decimal System name in 2014, and are booked for more shows, according to the lawsuit. The Doobie Brothers began using the name in 1970, and received a trademark for it in 1982. They received a trademark for Doobies in musical performances the same year, and a Doobie Brothers trademark for musical recordings in 2003, all according to the band's lawsuit. The band says the Doobie Decimal System "highly phonetically and visually similar to" the Doobie Brothers and that the similarities "have been exacerbated" by McNamee's and Crosby's use of the marks with "Doobie" in a much larger font on websites and promotions. The Doobie Decimal System promotes itself band on several websites, one of which features a raccoon smoking a reefer with "Doobie Decimal System" emblazoned on its front and the word Doobie in a larger font. "Doobie" is slang for a marijuana cigarette. Its first recorded use was in 1967, according to the Merriam-Webster dictionary. Though slang words customarily predate recorded use of the terms, "doobie" was a recognized alternative to reefer by 1969, according to veterans of the era. The issue could become important if the defendants try to defend their band name by claiming the term was in common use, and not protectable, when the Doobie Brothers protected it. The Doobie Brothers say they learned of the Doobie Decimal System in May and demanded McNamee and Crosby immediately stop using the trademark work, but the duo stopped responding and continue using the infringing mark. The Doobie Brothers seek an accounting, an injunction and punitive damages for trademark infringement, false designation of origin and unfair competition. They are represented by Lawrence Townsend with of Owen, Wickersham & Erickson, who was not immediately available for comment. Nor were Roger McNamee or Jason Crosby. Doobie Brothers founding member Tom Johnston said the band got its name from a neighbor in Northern California who suggested it in 1970 after they began performing. Johnston said the band intended to use it for only a couple of months but never came up with another name. The Doobie Brothers have sold more than 40 million albums since 1971, with two number-one hits, "Black Water" in 1974 and "What a Fool Believes" in 1979. Their other classic rock staples include "China Grove," "Jesus Is Just All Right" and "Listen to the Music." As slang terms are adopted into common use, they customarily are dropped and replaced by newer words among the group where they originated. Part of the lure of slang terms is their unintelligibility among the uninitiated.